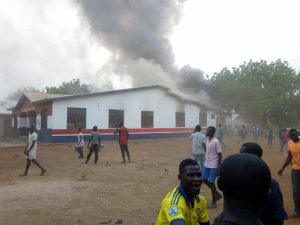 Violence has erupted in Salaga South following the citing of Damango as the regional capital of the newly created Savanna region. Office belonging to the ruling New Patriotic Party (NPP) in the constituency has been burnt by some angry youth who are against the decision to have Damango as the capital. The angry youth also destroyed billboards of the party in the area. According to them, Salaga deserves to be the regional capital. They have also destroyed the roofing, fridges, widows, satellite dish and computers st the party’s office.. Personnel from the fire service were also prevented from bringing the fire under control.